Hey! That’s a pretty good rendering of Suzanna Leigh, the movie’s lead character! 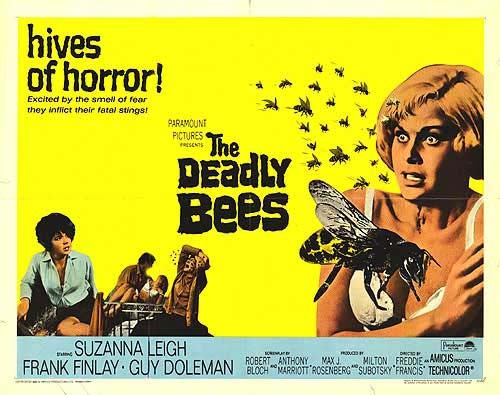 For my second installment in the two part series of non-Hammer films that were directed by Hammer directors, here’s a pretty lame but occasionally fun thriller called The Deadly Bees. To be honest there’s really nothing to complain about since the movie delivers exactly what it promised; it’s just that, ya know, deadly bees aren’t exactly the most exciting form of screen danger and, when you direct the movie like you would any other Hammer horror film, that is by trying to build up suspense and not just have a constant flow of action or violence, you tend to turn your movie into a snoozer. The movie also tries to be really hip and modern, opening up with a sequence at a TV studio where we see a completely pointless and wasted performance from the Birds (not the Byrds), a wicked R&B, mod rock group who had Ronnie Wood before he was in the Creation and the Stones. The focus switches to Vicki Robbins (Leigh) a popular singer, who passes out on camera due to exhaustion (surely not from drugs!) and, as a result, gets carted off to some island (actually an obvious “small village” set with a painted backdrop) to stay with some assholish, bee-obsessed professor guy. As you would expect, things start to go wrong when bees start attacking people (and the family dog). But who’s bees are they? The assholish guy who is mean to his wife and flirts with the local barmaid or is it the very friendly but somewhat suspicious other scientist? Oh the mystery was killing me! Actually it wasn’t at all. I really didn’t care. And now, here’s Joi Lansing singing “Web of Love”!